Spider-Man Spider Verse Reading Order! It’s been a good long while since we’ve heard from Morlun, the ultimate enemy of spiders first introduced way back in part one of the Marvel reading order, during J. Michael Straczynkski and John Romita Jr.’s run on Amazing Spider-Man. Defeating him once nearly cost Peter Parker everything. In a world of Green Goblin and Doctor Octopus, Morlun is still possibly the toughest enemy Spider-Man’s ever faced. It’s no suprise, then, that Morlun (and his family of inheritors) would threaten every Spider-Man, in every reality, ever. It’s an insanely ambitious event from writer Dan Slott and company, but for a Spider-Man fan, it’s a goldmine. Every incarnation of Spider-Man you’ve ever seen, from comic book versions, to superior versions, to TV fan favorites, they’re all here. Although it was published concurrent to Avengers vs. X-Men: Axis, Spider-Verse is contained to the Spidey titles, meaning there isn’t a whole lot of overlap with the Marvel Universe at large. If you have any questions about the reading order below, be sure to let me know in the comments, on twitter, or directly! Thank Leopardon, the full event trade collections are back in full swing with Spider-Verse! Marvel’s checklist has this issue after Amazing Spider-Man #13, but you’ll definitely want to read it before to avoid spoilers. Note that this is part 5 of 6 in the Amazing Spider-Man Spider-Verse saga, and the action really heats up in this issue. The die is cast! So I always compare your reading orders to the one’s on the marvel comics app, because their reading orders look pretty solid. Some of the issues on the app are in a different order here. I know that in one of these cases was to avoid spoilers, but should I use the order that the app gives me or the one that is shown here. I was looking at comics to buy on amazon and I was planning to start collecting these one’s, but they seem to be duplicates sold. The prices are different and I’m not sure if the covers are different or the number of pages there are. I can’t tell what order they are in and witch ones to buy. I now they are numbered but I just want to get the right ones. also what is the first Volume? I haven’t gotten to reading this event just yet, but can I understand what’s going on if I skip the Spider-Man 2099 related issues? I don’t want to read through issues of that comic just yet. Mostly because I want to get back to reading Spider-Man 2099 after I catch up with the Spider-Man (Peter Parker) comics. Never mind. I’ll just read them. So for the trade paperback or whatever its called, do you read it in the order printed in the book or the order you just gave. I’m a little confused. Your missing the Gaurdians of the Galaxy FCBD second story which is an edge of spider vers tie in….. I just wanted to know why the Amazing Spider-Man Annual 01 appears on the main page of the Marvel NOW era as part of the Spider-Verse but is not listed here ? PS : I’ve noticed the same thing on some other series. I’ll give it a glance, but likely just published during the same time period, but not really a part of the event reading order. Why are issues #4-6 of Amazing Spider-Man placed on this list? Aren’t they “Original Sin” tie-ins? 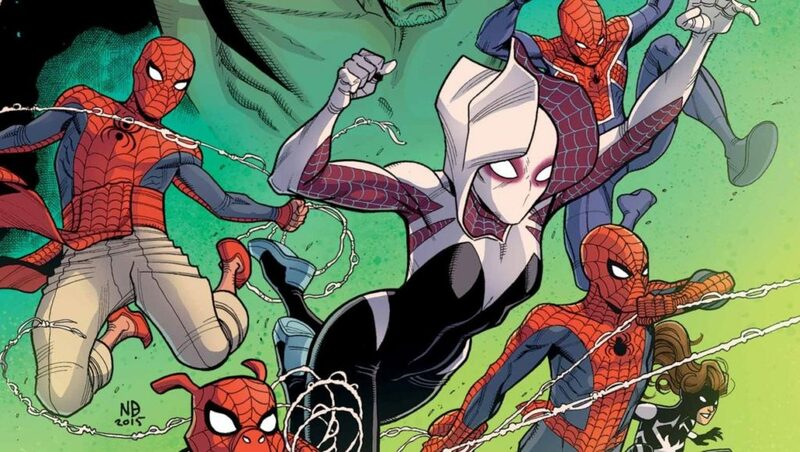 They are, but those issues also explain what Silk’s doing hoping around Spider-Verse. Helps provide background. Spider-Woman 4 needs to be added after ASM 14. It is an epilogue to the Spider-Verse.